If you want to take this basic idea and go a few steps further, try outdoing the alleged (Wikipedia-fied) current record of 17 nested birds. That one features a bustard (I think I need a bird dictionary) stuffed with a turkey, a goose, a pheasant, a chicken, a duck, a guinea fowl, a teal, a woodcock, a partridge, a plover, a lapwing, a quail, a thrush, a lark, an Ortolan Bunting, and a Garden Warbler. For some reason, though, I don't think 17 is the number to beat. I have a feeling it's at least 21. Or stick to the common Turducken of 3 birds and wrap the whole thing in bacon as featured in (yes, this news site does exist) Bacon Today. 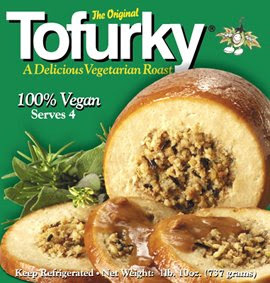 And if you're vegetarian, stick with Tofurky. Sounds enough like Turducken so you don't feel left out. Very enlightening! 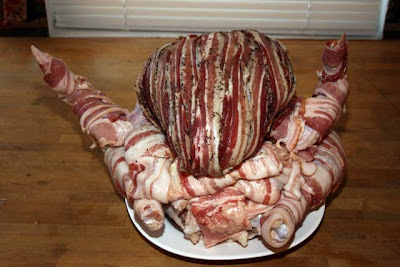 I may have preferred to stay in the dark - the bacon turducken especially made me think, "I'll skip the turkey this year and go for the veggies." Thanks for another fun read!! 1.Skin, trim and clean camel (once you get over the hump), lamb and chicken. 4.Fry nuts until brown and mix with rice. 5.Hard boil eggs and peel. 6.Stuff cooked chickens with hard boiled eggs and rice. 7.Stuff the cooked lamb with stuffed chickens. 9.Stuff the camel with the stuffed lamb and add rest of rice. 10.Broil over large charcoal pit until brown. 11.Spread any remaining rice on large tray and place camel on top of rice. 12.Decorate with boiled eggs and nuts. 13.Serves a friendly crowd of 80-100. I don't know about that bird within a bird within a bird! That looks a little gross to me. 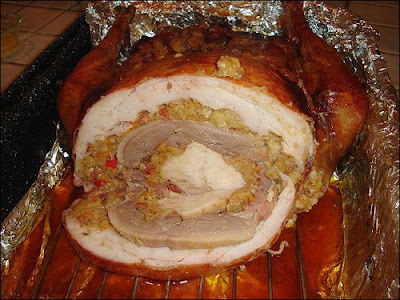 ctjhia - i can't believe I'm talking to a real live human who has tasted Turducken before! I don't if I've ever met one before. :) that's hilarious that you ordered one on Saturday!